The SHA has been circulating a "fact sheet" among lawmakers in the General Assembly (which you can read here) as their argument as to why the state's speed camera law should not be amended to require "secondary evidence of speed" from speed camera images. This document was so pathetic it is utterly amazing that anyone was persuaded by it. However many lawmakers have bought into this deception. The Maryland Drivers Alliance now offers our point-by-point rebuttal of the SHA Fact Sheet. OUR RESPONSE: The program is also "jointly" run with the help of speed camera contractor Xerox Corporation, the same speed camera contractor which systematically issued the erroneous citations in Baltimore City. SHA Statement #2: The SafeZones program uses scanning LIDAR (Light Detection and Ranging) technology. The LIDAR system does not simply use two photographs and the distance and time between those two photographs to calculate speed. The photographs provided through SafeZones are used to demonstrate that a vehicle was, in fact, at the location in question and that it was moving. OUR RESPONSE: It is not against the law for a vehicle to be "at the location and moving". Nobody has ever suggested the use of images to REPLACE the recorded speed made by radar or LIDAR, only to provide a mechanism to VERIFY it. SHA Statement #3: The calculation of speed is averaged based on the thousands of measurements through the work zone; therefore the LIDAR system cannot effectively rely on only two images and the time lapse between them to accurately calculate the speed of a vehicle. In fact, the LIDAR system is more accurate than using the two time‐stamped images to calculate speed. OUR RESPONSE: This statement would lead one to believe that the LIDAR measurements are taken over a long distance or long period of time comparable to the distance "through the work zone", which is not the case. The LIDAR measurements are taken over a very short distance, at most a few tens of feet if not much less. If the photos are taken immediately after the speed reading the vehicle's speed would not change that substantially in such a distance. If on the other hand the time difference between the recorded speed and the photos being taken is substantial, then that would raise a whole new issue of whether the correct vehicle had been photographed, since a different vehicle might have moved into frame and been cited for the speed of another car. That would be all the more reason why verification is necessary. The fact that LIDAR by its nature takes multiple distance measurements does not mean it is infallible. Any speed measurement device has the potential to produce errors. Baltimore City and Xerox corp made numerous claims about how accurate their equipment was as well, yet it turns out that the devices used in Baltimore were wrong. A recent audit of the SHA in November of 2012 revealed that the SHA's equipment did not meet standards for certification and testing which had been established, and that a requirement that hardware be approved by the IACP was dropped. As such there is every reason to believe the SHA's equipment is capable of producing errors, and that errors would go undetected because the SHA has consciously chosen not provide a means to verify recorded speeds. SHA Statement #4: For higher‐speed, multi‐lane work zones, using time‐stamped images to calculate speed is not possible without performing complex calculations to correct for photographic distortions. Not only does the placement and angle of the camera distort the precise location of a vehicle in an image, but the changing dynamics of a work zone may cause the distance travelled to be difficult to precisely determine (i.e. a lane shift in a work zone makes calculating the distance travelled between two photos difficult). Given the quick succession of the photographs and the speeds of vehicles, if the precise location is off by even a few inches, the calculated speed changes. OUR RESPONSE: It is not necessary to produce an exact speed calculation from every citation, nor is anybody proposing that the images be the ONLY means of determining speed. It is only necessary that it be POSSIBLE to calculate speed accurate enough to VERIFY the radar/LIDAR speed reading and confirm that the vehicle was in fact traveling 12 mph over the limit. If the two measurements substantially disagree, the driver is rightly entitled to the benefit of the doubt because the presumption of innocence is a core principal of our justice system. There are several ways to improve the accuracy of estimates, such as physically painting lines on the road or digitally imposing a ruler or template image onto the citation images. This would make determining the distance traveled more accurate. An alternative form of "secondary evidence of speed" might include video clips, similar to the ones which first revealed the systematic speed camera errors in Baltimore City. NHTSA standards for across the road radar state that "If the ATR device is to be considered for unattended operation, the manufacturer shall provide a secondary method for verifying that the evidential recorded image properly identifies the target vehicle and reflects this vehicle’s true speed, as described in §5.18.2. This may be accomplished by means of a second, appropriately delayed image showing the target vehicle crossing a specified reference line." The NHTSA would not have stated this if calculating speed from citation images was unfeasible. The fact that the equipment is used on multi-lane highways raises a whole new scenario where the wrong vehicle could be cited based on the speed of vehicles in an adjacent lane. This is all the more reason why secondary evidence should be required. SHA Statement #5: The best way to ensure the systems are in working order and to ensure public confidence in their accuracy is to demonstrate that the cameras are always calibrated. If the cameras are calibrated appropriately, they will generate accurate citations. MDOT can state that every camera deployed in the SafeZones program has remained calibrated and has been verified to be accurate. OUR RESPONSE: The SHA's equipment is provided by the same contractor who provided the erroneous cameras to Baltimore City. And the same company which performed the annual calibration checks on Baltimore City's cameras (MRA Digital) and gave those faulty cameras a passing grade, also performs the calibration checks on the SHA's cameras. The fact that Baltimore's cameras passed all their tests and still issued erroneous tickets proves that calibration to a manufacturer spec does not ensure accuracy. In fact the SHA has not even always met all requirements for testing, as the state audit has shown that they allowed the manufacturer of the devices to certify their own equipment for the first nine months. 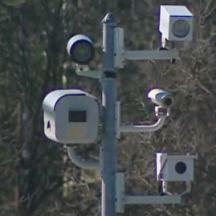 The SHA's cameras are used on roads with tens of thousands of vehicles passing them each day. Even if the rate of 'false triggers' is less than one in 10,000 (1% of 1%), with that type of volume errors are still quite likely to occur. Yet such a 'glitch' might never present itself during a calibration test or even a field test with several hundred runs. Additionally, there is no telling what form of speed measurement system the SHA or a local government might choose to employ in the future, and what sort of unidentified defects such systems could have. For example speed camera contractor Optotraffic uses a proprietary technology which only that company fully understands, and which has never been thoroughly vetted by a nationally accredited organization like the NHTSA or IACP. A hard requirement for a standard of speed verification should be established NOW to ensure that any type of system used by either the SHA or a local government in the future can be audited for reliability after the fact, regardless of the type of technology it uses. The real reason the SHA does not want a requirement for secondary evidence of speed is because they fear errors will be discovered in their own system. By denying this, they are creating a presumption of guilt, and they are telling the public that in Maryland "money from the innocent is the same as money from the guilty". THAT is what is undercutting public confidence in the SHA's program. Availability (and admissibility in court) of secondary evidence of speed in the form of time stamped photos (to 1/100th second or better), or by means of a recorded video clip, needs to be incorporated into the law.